12x18 - Rust-Free Heavy Gauge Aluminum No Sunglasses At Night Sign. 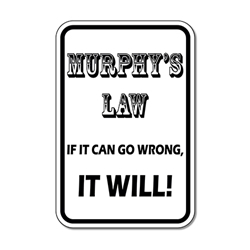 Murphy's Law ("If anything can go wrong, it will") was born at Edwards Air Force Base in 1949 at North Base. It was named after Capt. Edward A. Murphy, an engineer working on Air Force Project MX981, (a project) designed to see how much sudden deceleration a person can stand in a crash. One day, after finding that a transducer was wired wrong, he cursed the technician responsible and said, "If there is any way to do it wrong, he'll find it." The contractor's project manager kept a list of "laws" and added this one, which he called Murphy's Law. Actually, what he did was take an old law that had been around for years in a more basic form and give it a name. DOUBLE the working life of yourMurphy's Law Sign by adding 3M Protective Overlay Film (POF)! 3M’s high-tech POF protects sign faces against fading caused by the sun and harsh weather—and makes graffiti defacement damage easy to clear away without harsh abrasives.